Those are some great photos you have. Mexico looks like a vibrant, colorful place to visit. Loved reading all of these. Hoping to read more of your adventures. By the way, newbie here as well. Aside from being a poker enthusiast, I'm also a critter-lovin' guy. I live with my Pomeranian, Kyle. Whenever I'm outdoors, I usually walk my dog in the park, though as a precaution, I'd fit him with one of those sportdog collars, as he tends to wander off most of the time. So, that's me. Have a nice day, everyone! 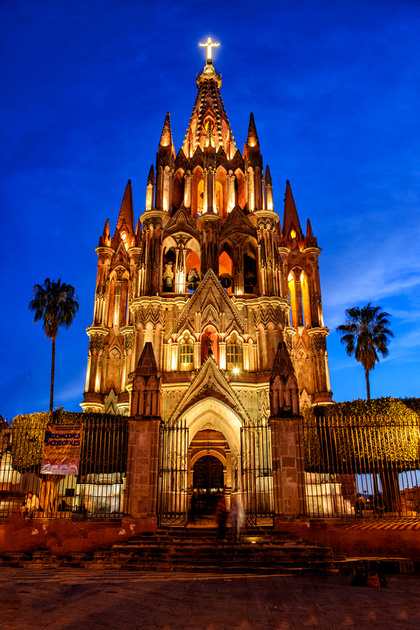 Visit the World's Best Small City: check out the new blog post about San Miguel de Allende. Two great campgrounds available! We crossed back into the US via Nogales. Currently enjoying the weather and scenery at Madera Canyon in Arizona. Proud that my latest article on the best spots to see grizzly bears was published! Hi I just looked through your website. I love your photos. I think central Mexico is really the most beautiful part. I have been all over Mexico for work and vacations. I have visited Monterrey three times so far this year. Did you go to Guanajuato and Queretaro? Both are about 1.5hs drive either direction from San Miguel De Allende. We agree on loving central Mexico (the highland plateau). We just spent a few weeks traveling the coast from Mazatlan to Nogales and had forgotten how much we hate humidity, mosquitos and sand flies! Yes, we visited Guanajuato in 2014: great city. My picture of the campground there with the colorful houses in the city's hills won the annual Truck Camper Magazine photo contest in 2015. We have yet to visit Queretaro. This last winter, we went South from San Miguel to visit Model is and Patzcuaro (and then turned west towards Lake Chapala and the West Coast). We're currently in the mountains of New Mexico, NW of Silver City. New blog post about visiting the pyramid city of Teotihuacan, Mexico. Explore one of Mexico's crown jewels: the pyramids at Teotihuacan. Visit the Pyramids of the Moon and Sun, and the Avenue of the Dead! Talking about these cities makes me want to take another road trip through Mexico! I love all the history in Mexico. I just read your blog about Teotihuacan. The pictures don't do it justice. I suggest a visit to anyone that will be near Mexico city. Its a nice hike to the top of the Pyramid of the Sun! I love that you mentioned Graham Hancock's book, Fingerprints of the Gods. I reticently purchased that book after listing to him on the Joe Rogan pod cast. Did you visit Chapultepec Castle in Mexico city? We haven't visited Mexico City yet. We could have taken the bus into the city when we camped at Teotihuacan; the size & population kinda scares us away. Perhaps on a future visit to the area. I enjoyed reading the books by Graham Hancock and some co-authored with Robert Bauval. Interesting stuff to think about.